Graphene, the 2-D allotrope of carbon, is well known for its remarkable electronic and optical properties. Nitrogen doping can manipulate local electronic structure and thus improve the performance of a graphene powered device. Therefore, developing a method of graphene production that is low in cost, simple in operation and high in controllability is important. It carries a vital value for the industrial applications of graphene materials in the future. 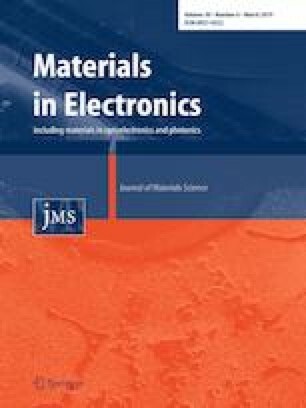 For this study, graphene oxide (GO) and GO/AuNPs (gold nanoparticles) films were prepared using plasma jet printing technology. Then, a dielectric barrier discharge at a sub-atmospheric pressure in nitrogen gas was used to obtain N-doped and reduced graphene oxide (N-rGO). The microstructure of the sample was observed using a scanning electron microscope. Then, the materials were analyzed using X-ray diffraction, Raman spectra, Fourier transform infrared spectroscopy and X-ray photoelectron spectroscopy. Finally, the cyclic voltammetry profiles and galvanostatic charge/discharge curves of N-rGO and N-rGO/AuNPs capacitors were tested. Results have indicated that the ultimate materials with a porous structure after the nitrogen plasma treatment presented a pretty good capacitor performance.